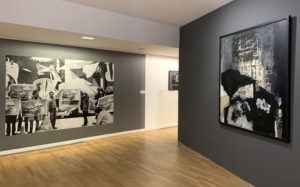 Picasso and the Exodus, A Spanish History of Art in Resistance is following the exhibition Guernica, which took place at the Musée National Picasso Paris in 2018. The exhibition traces the political commitment of Picasso and his fellows. In 1937, a year after the beginning of the Spanish civil war, and while he is creating a painting for the Pavilion of the Republican Spain at the International Exhibition in Paris, Picasso learns about the bombing in Guernica; this event shakes his initial project. The political developments back then are strongly influencing Picasso, as well as the Spanish artists already settled in France. In February 1939, after three years of civil war, some 500 000 Spanish are crossing the border between Spain and France before transiting in refugee camps. Following the “Retirada”, a number of Spaniards living abroad are de facto becoming political exiles. Antoni Clavé is present throughout the show, in several parts of the exhibition, with ten works (camp drawings, paintings, prints, books for bibliophiles, scale models), a number of photographs and collective exhibition catalogues, hence recounting the common journey of these Spanish artists in exile, and highlighting the privileged friendship between Clavé and Picasso and their common approach. Picasso had made the wish not to come back to Spain under Franco’s regime; he passed away in 1973 without being able returning to his native land. 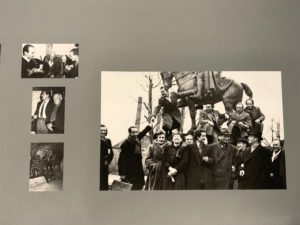 In the 70s and 80s, the debate regarding whether Guernica should be sent back to Spain highlights the extent to which this artwork has become a political symbol (and is still one of the most reproduced, filmed and reinterpreted one). Upstairs in the museum, the return of this emblematic work is broached, as well as artworks by artists such as Saura, Tapiès and Clavé. 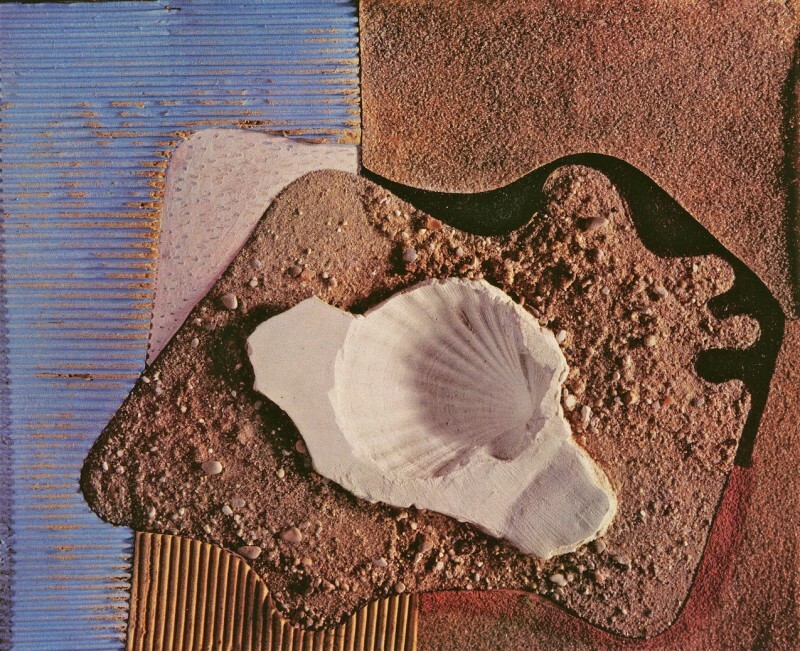 The museum indeed bought Composition avec 4 gants (1970, mixed technique) directly from the artist in 1982. 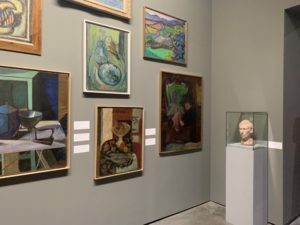 Last but not least is the contemporary section of the exhibition, with a bit more than 20 artists shown. Some stress the major importance of Picasso in their artistic and individual freedom, while others are broaching the theme of Exodus nowadays. 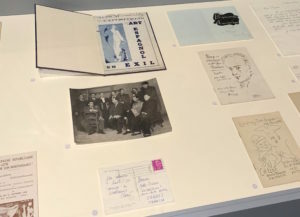 Picasso and the Exodus, A Spanish History of Art in Resistance, at the Abattoirs in Toulouse, March 15-August 15 2019. 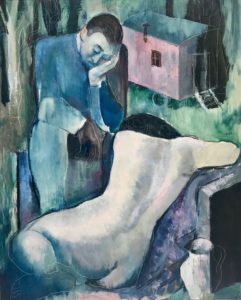 Thursday 18, 2019 at 6:30pm, auditorium des Abattoirs: conference about the migration of the Spanish artists, with Amanda Herold-Marme, art historian and author of a thesis with the same topic, and Géraldine Mercier, associated curator of the exhibition Guernica (Musée national Picasso, Paris) and co-curator of the exhibition Picasso and the Exodus.